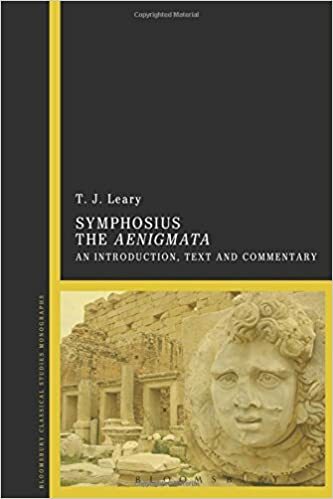 The post-classical compilation known to modern scholarship as the Latin Anthology contains a collection of a hundred riddles, each consisting of three hexameters and preceded by a lemma. It would seem from the preface to this collection that they were composed extempore at a dinner to celebrate the Roman Saturnalia. The work was to have a defining influence on later collections of riddles; yet its title (probably the Aenigmata) has been debated, and almost nothing is known about its author: questions have even been asked about his name (Symphosius?) and date (4th-5th centuruy Ad?). In this edition of the riddles, the Introducion discusses the work's title and its author's identity: as well as his name and date, it considers his national origin (North African?) and intellectual background (a professional grammarian? ), and argues that he was not Christian, as has been suggested. It examines the Saturnalian background to the work, setting it in its sociological context, and discusses the author's literary debts – especially to Martial. The Introduction also explores the author's ordering and arrangement of the riddles, discusses his literary style, Latinity and metre, and comments briefly on his Nachleben. It concludes with a survey of the textual tradition. The commentary on each riddle includes a translation, general notes on the object it describes (with reference, as necessary, to museums and artefacts), and discussion of how it fits into the ordering of the collection, of variant readings and, with suitable illustration, of literary, stylistic and metrical considerations. Other areas, such as history and mythology, are also covered where relevant.